However, its main historic significance as far as Nights in the Past is concerned is that it was visited by Queen Anne, the last of the Stuart monarchs, in 1704. 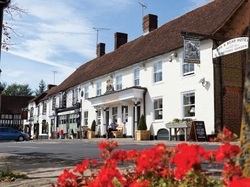 Lenham itself is a market village (as opposed to a “market town”) with a history stretching back at least as far as the Domesday Book, and it is on its pretty square that the Dog and Bear is located. The property features 24 guest bedrooms in all, a restaurant, bar, and welcomes well behaved dogs (a small extra charge may apply). Maidstone and Ashford are both just a short drive away.